Crested Butte, with its steeps looming above gentle beginner slopes, is the perfect playground for more adventurous families where luxury is not necessarily important. They’ll mix quite happily with ski bums who come to the resort for its expert terrain and a laid-back, hippie personality. Its historic downtown area is incredibly picturesque - old Victorian mining buildings surrounded by steep mountains with some fantastic restaurants and bars. Excellent ski school, impeccable grooming, and good variety of accommodation rounds out the reasons why Crested Butte is a terrific choice for a ski holiday. The town’s main street with its colorful wooden buildings. The 542ac (219ha) of in-bounds extreme terrain to keep the most adventurous adrenaline junkie happy. Non-existent lift lines and uncrowded slopes. Relaxed family friendly atmosphere with none of the pretentiousness of other big resorts. Impeccable grooming. The best corduroy runs of your life. The towns shuttle buses are painted by locals in funky colors to reflect the quirky personality of the town. Access to a lot of the expert terrain requires a combination of lifts or hikes. There aren’t many accommodation options in the town area. Most are centered in the mountain village area. Getting here takes time – the closest airport is Gunnison (30 minutes) and Denver is a 5-hour drive. 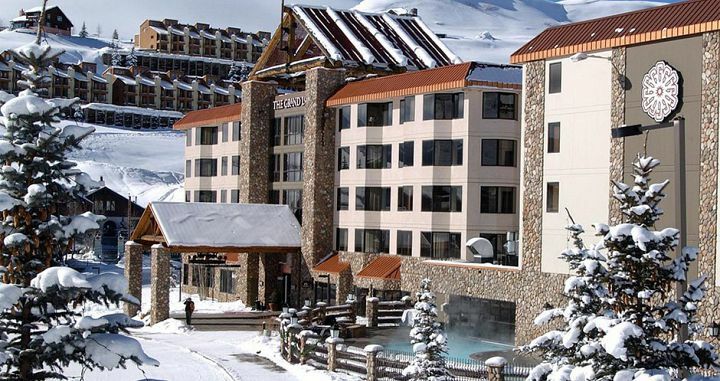 One of the best value resorts in Colorado for families. With a base elevation of 9100ft (2774m), you may feel the effects of altitude if coming from lower elevations. First Descent in town makes unbelievably good coffee and freshly baked bread. Crested Butte is a ski resort with a split personality – the laid-back, friendly atmosphere is a vast contradiction to the extreme terrain and sharp peaks that will challenge the most expert skiers. Crested Butte’s isolation means no crowds, no lift lines and more powder for everyone to share. And while that seems better suited to ski bums and powderhounds, families with skiers of all abilities are just as likely to have a good time thanks to some excellent beginner and intermediate terrain and some fun side activities for kids. Crested Butte has two main areas; a 6-minute drive separates the downtown area and the mountain resort where most of the accommodation is located. The village there has plenty of services and its small size means lifts are rarely further than a short walk (some are even ski-in/ski-out). There’s no glitz or glamour here – just a genuine ski resort that feels like what Aspen might have been like about 20 years ago (before Wall St invaded), with everything you need for a ski vacation all in the one spot. The historic main street is lined with colorful Victorian-era buildings and the rest of the town is a collection of small wooden homes bringing out a true-mountain feel to the town. But if you think this is just a sleepy little town, you’ll be pleasantly surprised by the quality of the restaurants and a fun nightlife to cap it off. Enjoy a fast-pased evening at The Secret Stash, serving up gourmet pizzas of every flavour combination possible, or savour local Colorado produce at Elk Avenue or McGill's. We couldn't go past tasting the locally craft distilled American rum at Montanya (hello Mojito!). What all this means is that Crested Butte represents fantastic value for money – where you get the combination of a world-class resort with a wide variety of terrain, a fun town with a rich local history and true Colorado mountain vibes, all paired with budget to mid-range accommodation. 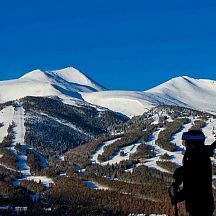 The perfect spot for a families first ski vacation or to experience an authentic Colorado ski town. Crested Butte is best known for its steep terrain - some of the gnarlist double black diamond runs in all of Colorado. But don't let that put you off this mid-size ski resort, there is plenty of great skiing for beginners and intermediate skiers and snowboarders. A relatively small resort (at only 1167 acres) compared to others in the US, but what it lacks in size it makes up for in the complete absence of crowds and no lift lines. We skied Crested Butte the day after President's Day Weekend, and there were no lift lines to be seen. The first-timers area for beginners at the base of the resort has some great mellow runs, and advanced skiers tend to steer clear of here. A multitude of green runs will also keep the newbies happy. For intermediate skiers & snowboarders, Crested Butte offers a good range of options for those wanting lots of vertical and to make groomer laps from top to bottom. Speaking of grooming - Scout has skied quite a lot of runs over the years, and Crested Butte definitely stands out above the rest when it comes to perfect corduroy slopes. The next step up is really for expert skiers - not a lot of runs cater to those mid-range ability level (advanced). However, for those wanting some nail-biting close encounters of the skiing kind, Crested Butte has the goods. Steeps with 50 degree pitches, tight trees, narrow chutes, cliffs and bowls can be found in the double black terrain of the resort, both accessible by the High Lift and North Face Lift. The Upper, Third, and Lower Third Bowls are a local's go-to, with a great run back to the East River Express. If you are happy to make the hike or traverse, you will be rewarded with some excellent terrain in both Teocalli Bowls (The Glades is also a favourite!). A few of the most memorable runs require a short traverse or hike out, but definitely worth the extra effort for those magical turns. Snowfall is generally pretty good at Crested Butte, but can be inconsistent at times. The area is a little colder than other areas in Colorado, so the snowfall does stick around a little longer and powder is nice and dry. The resort actually 'farms' snow, and uses a specific grooming technique as to avoid icy and slippery slopes. Crested Butte is part of the EPIC pass, allowing you to explore more of the resorts in both North America and Canada! Being really well set up for beginner skiers and snowboarders, Crested Butte is quite popular for families. The base area provides the perfect spot for kids to hit the slopes for the first time, remaining close to the amenities for when they get cold hands or need a mid-morning snack. This base area has everything you need in the the one location (which we love!) including rentals, overnight storage, retail shops, and restaurants. In the Whetstone Building you'll find absolute heaven for kids, with Camp BC providing childcare from the age of 2 months, and the BC Ski & Ride School, with various ski lesson programs for kids aged 3 and up. The snowboard specific program is particularly great, with a 1:2 instructor to participant ratio. The town of Crested Butte has some fantastic option for eating out, with plenty of different restaurants and cafes to keep everyone happy. A free shuttle bus connects the town to the resort area, being barely 3 miles apart. For lodging, staying on mountain has the upper advantage for families, and there are lots of options for condos and townhomes for those seeking ski-in/ski-out ease. Staying in town also has its advantages, being more economical for families, and more shopping and dining (and a great mountain town vibe). Here you'll find an array of hotels, lodges, and bed and breakfasts. For those non-ski days, families can't go past the Adventure Park, located at the base of the ski resort. Think bungee trampolines, rock climbing, mini-golf, and tubing! Throw in some snowmobiling, dog sledding, horse riding, and ice fishing, and you're sure to find something to keep everyone in the family happy for the day. 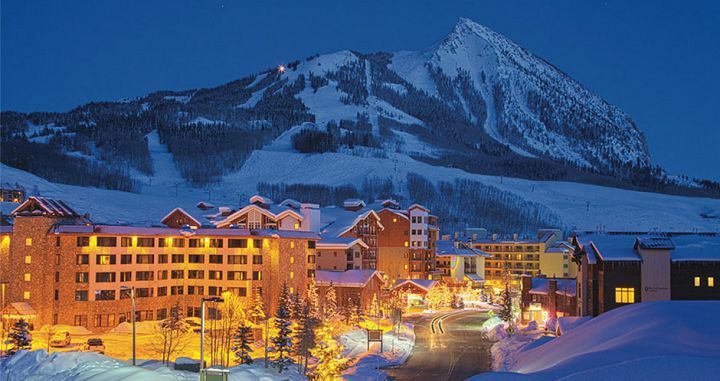 The best part of Crested Butte’s accommodation is the price tag. 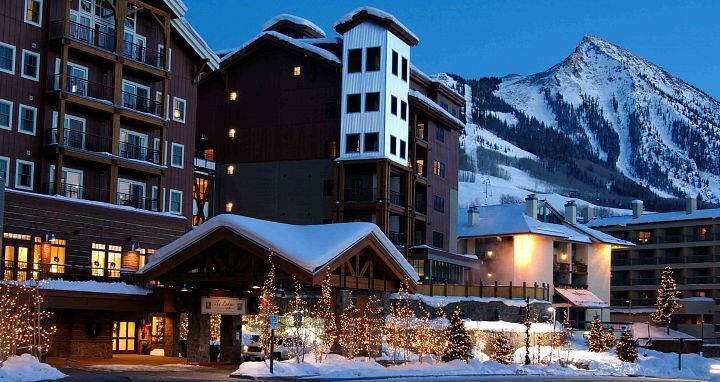 Crested Butte’s accommodation options are relatively limited due to its size and there are no big name luxury hotels. But all that adds to Crested Butte’s charm. There are a couple of hotels and condos, most of which are centered in and around the mountain village making them very quick and easy for accessing the slopes. For those wanting ski-in/ski-out access, a few condos and townhomes are available on-mountain. The town of Crested Butte Staying has its advantages, being more economical for families, and more shopping and dining (and a great mountain town vibe). Here you'll find an array of hotels, lodges, and bed and breakfasts. The resort shuttle provides easy access to the mountain (and it's barely a 3 mile journey). There are plenty of activities in the mountain village to keep families happy, including ziplining, an adventure park with an AirBag jump, rock climbing tower and tubing. There’s also the usual activities of snowmobiling, dog-sledding and snowshoeing. There is one day spa in the mountain village at Elevation Hotel. For something different enjoy a starlit sleigh ride to the charming Uley’s Cabin for a gourmet dinner. The best way to get to Crested Butte is to fly to Gunnison, the closest airport just 30 minutes’ drive away. Several airlines have direct flights. Alpine Express Shuttle has shared transfers. Dolly’s Mountain Shuttle also has private vans available. Alpine Express also services Montrose (1 hour 45 minutes) as does Telluride Express. Crested Butte is easy to get around thanks to the free mountain shuttle buses that run frequent services between the mountain village and town. There really is no need to rent a car when coming to Crested Butte. Crested Butte usually opens at the end November until around early April. February is usually the most reliable month for powder snow.